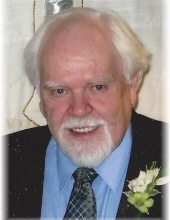 Donald P. Wilks, 84, of Bowling Green, Ohio passed away Monday February 4, 2019. He was born November 15, 1934 in North East, Pennsylvania to Paul and Kathryn (Waltz) Wilks. He married Beverly Shaw on June 12, 1954 and she survives in Bowling Green. Don was a 1952 graduate of North East High School in North East, Pennsylvania. He served a tool & dye apprenticeship with the General Electric Company in Erie, Pennsylvania, graduating in 1956. He then went on to General Electric’s inter-office program to learn all the manufacturing process. Later on he worked for Marathon Special Products, relocating to Bowling Green with their new plant. Don worked for several years as the purchasing manager at Green Manufacturing, retiring in 1991. He had many hobbies and interests including hunting, woodworking, fishing for salmon up north and deep sea fishing. On one deep sea fishing trip, Don caught a trophy sailfish. He most enjoyed traveling and camping throughout the United States with his wife Bev on their touring Aspencade motorcycle with several good friends. Along with his wife of nearly 65 years, Bev, Don is survived by his children Cindy (Ed) Tyrrell of Bowling Green, Brian(Tenita) Wilks of Maumee, Ohio, and Marcy Abke of Pemberville, Ohio, grandchildren Sarah (Rob) Schwind, Jamie (Mollie) Tyrrell, Suzanna (Eric) Eberly, Abigail, Logan and Sydnie Abke and Cassie Celestino, great-grandchildren Tyler Schwind, Kate and Clayton Tyrrell, Reid Eberly, Christian, Adelyn and Gracelyn Celestino. He is also survived by his brothers Richard (Janet) Wilks of Prospect, Kentucky and Thomas (Ann) Wilks of Alvin, Texas, several nieces and nephews and his beloved furry friends Molly and Mo. Don’s funeral service will be held on Saturday February 9, 2019 at 11:00 a.m. at St. Mark’s Lutheran Church, 315 S. College Dr. Bowling Green, Ohio 43402. Pastor Melanie Haack will officiate. Interment will follow at Oak Grove Cemetery in Bowling Green. Visitation will be held Saturday morning at the church from 9:00 a.m. until the time of the service at 11:00 a.m. Funeral arrangements have been entrusted to Dunn Funeral Home in Bowling Green. Memorial contributions may be given in his memory to St. Mark’s Lutheran Church or Bridge Hospice in Bowling Green. To send flowers or a remembrance gift to the family of Donald P. Wilks, please visit our Tribute Store. "Email Address" would like to share the life celebration of Donald P. Wilks. Click on the "link" to go to share a favorite memory or leave a condolence message for the family.